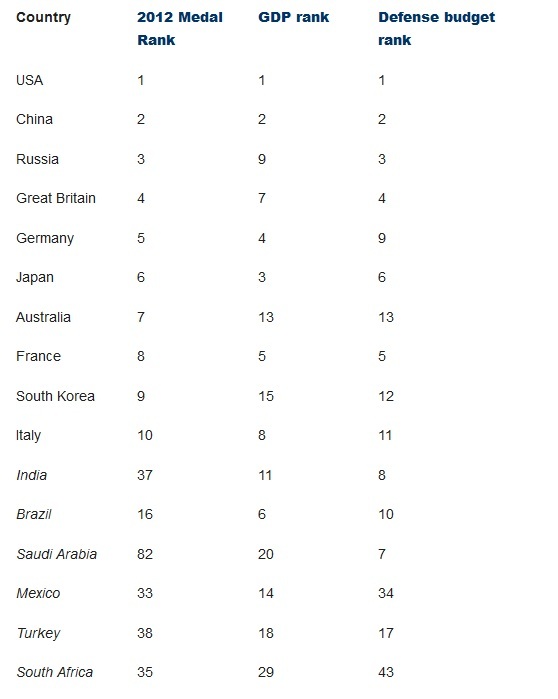 The British-based international magazine Monocle has release its annual list of nations’ soft power prowess. Britain came out on tips this year following the successful hosting of the Olympic Games. Northern Europe scored highly and the draw-card of the Germanic and Scandinavian nations were in general the arts, friendly business environments, entrepreneurial population, and good education systems. Continued economic troubles saw previous winner France and other southern European countries such as Spain and Italy sink on the list. The London 2012 Olympics are long gone, but still to note for a foreign policy wonk, an article in the Foreign Policy magazine makes an interesting comparison between the final medals table and other measures of national power. There is more than just a hint of similarities between sporting prowess and GDP. According to a poll by the polling institute YouGov carried out in the Middle East and North Africa, Spain is the most popular team in the Euro 2012 championship. The poll asked those most likely to watch the Euro both which team they want to win and which team they expect to win. Spain scored highest on both questions. Football, or soccer as it is sometimes referred to, has become an important tool for projecting European soft power, as well as a profitable export to an Asian audience.